This page covers advantages and disadvantages of M2M Communication. It mentions M2M Communication advantages or benefits and M2M Communication disadvantages or drawbacks. M2M refers to Machine to Machine Communication. The term M2M communication describes devices which are connected to the internet using fixed/wireless networks and communicate with each other as well as with other devices on the network. They are known as active communication devices. M2M communication is one element in the network made of smart meters, smart lighting, smart parking etc. Ideally M2M communication provides instantaneous secured access to the internet at any place at any speed. It works both indoors as well as outdoors. M2M supports various network topologies such as star, mesh, tree, peer to peer etc. MQTT protoco is used for M2M, WSN and IoT scenarios. MQTT uses publish/subscribe model having asynchronous communication with messages (i.e. events) between clients and server (i.e. broker). Other protocols are also used in various M2M networks. The network domain include following. 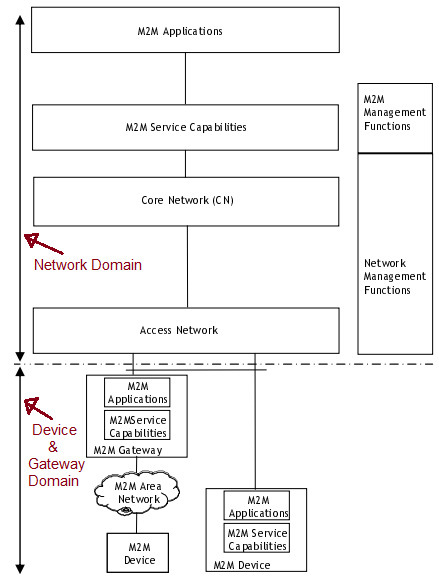 M2M devices are connected to network domain via multiple M2M gateways. Some of the examples of M2M area networks are PAN (Personal Area Network) and LAN technologies. PAN technologies include 802.15.1, Zigbee, ISA100.11a, bluetooth, IETF ROLL etc. LAN technologies include PLC, KNX, M-Bus, wireless M-Bus etc. M2M communication is used along with IoT to provide vast storage, resources and protection. Some of the characteristics of M2M communication are as follows. -Large number of short lived sessions. ➨M2M communication is supported by cellular networks either directly or through gateway. ➨It is easy to roll out and maintain. ➨It is available with fixed and mobile networks both indoors and outdoors. ➨It offers higher range, minimum latency, higher throughput and consume less energy. ➨It enables communication of smart devices without any human intervention. ➨The security and privacy issues in IoT networks are resolved by using M2M communication facility. ➨Large protection, data collection and data processing is possible. ➨Use of cloud computing in M2M means dependence on others which could limit flexibility and innovation. ➨Security and ownership of data is a big concern. ➨Interoperability between cloud/M2M IoT devices is a big concern in such networks. ➨It is designed and optimized for small number of network devices. ➨M2M communication requires availability of constant internet connection with reasonable speed.